SCHRAEMBL - Karte von den N.W.Amerikanische und N.O.E. Asia..
SCHRAEMBL, F.A. 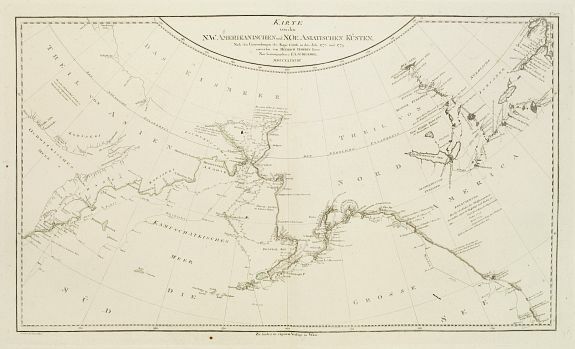 - Karte von den N.W.Amerikanische und N.O.E. Asia..
Karte von den N.W.Amerikanische und N.O.E. Asia.. - SCHRAEMBL, F.A. Map maker : SCHRAEMBL, F.A.. Size : 15.1 x 26.4 inches. / 38.3 x 67.0 cm. Description :A detailed large-scale map showing the Bering strait, Kamchatka, Alaska and much of North America. While the Russian coastline is shown with reasonable accuracy. Showing tracks of Captain Coo. With interesting detail in north western part of America. Condition : Very good condition. Wide margins.